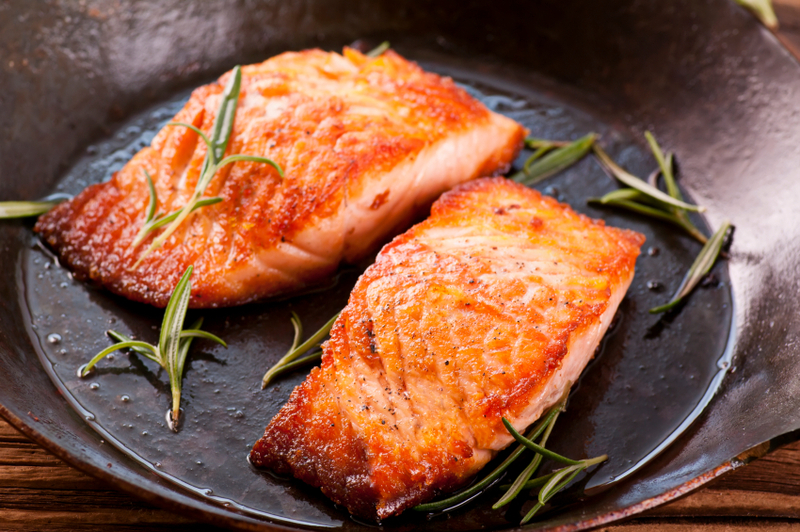 Salmon is a superfood when it comes to menopause – or any time of life. But not any old salmon will do. You see, the point of eating salmon, is to bulk up on omega-3 fatty acids. They've been shown to reduce the inflammation that leads to lots of chronic disease, including heart disease, cancer, Alzheimer’s and more. An American Journal of Clinical Nutrition study of 210 people aged 70-89 found fish eaters had significantly less cognitive decline than non-eaters. And animal studies show omega-3s in salmon are effective for treating serious mood disorders, stress, and even alcohol abuse. But here's the thing. Your salmon must be wild-caught. What's Wrong With Farmed Salmon? Farmed salmon don't give you the same omega-3 benefits. It has to do with their diet. And as you know, you are what you eat AND what your food eats. Farmed fish eat GMO grains like corn, soy and canola that are high in pro-inflammatory omega-6 fats. That will make chronic inflammation worse. Commercial fish feed is also known to contain chicken feces, and pig and duck waste. Yuck. Fish don't exactly thrive on that nasty food, so they're also fed antibiotics, chemicals, and growth hormones to speed up production.And even though it contains much more fat, farmed salmon contains two or three times fewer omega-3's than the wild version because of their grain-based diet. Thanks to industrial production methods, farmed salmon contain seven times more PCBs (polychlorinated biphenyls), dioxins and pesticides than wild salmon. PCBs are persistent cancer-causing chemicals that were banned in the U.S. in 1976. According to the Environmental Working Group seven out of ten farmed salmon purchased in grocery stores in Washington, DC, San Francisco, and Portland, Oregon had PCB levels that raise health concerns. They say farmed salmon in U.S. grocery stores are likely the most PCB-contaminated protein in the food supply. It has about 16 times the PCBs found in wild salmon. Could things get any worse for farmed salmon? Yes. The FDA recently gave the go-ahead for sales of a genetically modified salmon called AquAdvantage. It contains a genetically modified growth hormone gene from the Chinook salmon. It also contains a genetic switch from an ocean eel. The eel switch keeps the growth gene continuously active so the fish grows all year round instead of seasonally as natural fish do. The GM fish grow to market weight in 18 to 20 months instead of 28 to 36 months for conventionally farmed salmon. We don't know what the long-term effects of inflated growth hormone levels would be in people eating these fish. And as one fish farmer noted, twice the growth rate of these fish is likely to mean twice the toxicity. GMO salmon is set to hit the markets in about two years. And by the way, the FDA did not require that these fish be labeled as genetically modified. Here's what to do to make sure you're getting the best natural salmon. Ask your fishmonger for wild-caught salmon. It will be more expensive but you deserve the best. Avoid "Atlantic" salmon. All Atlantic salmon sold in the U.S. are farmed. Farmers also raise Chinook and Coho salmon so make sure you get the wild versions of those. Sock-eye salmon cannot be farmed so it's always wild. Look for seafood labeled "Alaskan." By law fish labeled Alaskan cannot be farmed.Canned Alaska salmon is a good choice. 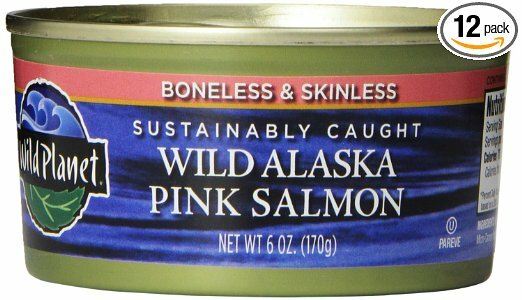 Click here to check out Wild Planet's canned Alaska Wild Salmon. In a restaurant ask if the salmon is farm-raised. If it's Pacific salmon, it's probably wild. If it's Atlantic, it's farmed. Don't be fooled by "ocean raised" labels. Farmed fish are raised in floating pens near the ocean shore. That doesn't make them wild. And they are still fed an unnatural diet. Click here for more healthy foods for menopause. "7 Secret Superfoods to Escape Hormone Hell and Breeze Through Menopause"